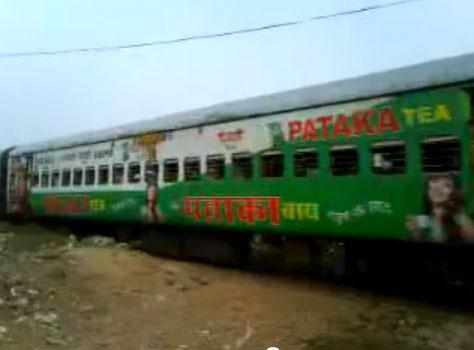 Few days back I saw a very funny looking Malda Town - Delhi Farakka Express (13483) train. The whole train was full of advertisements from some Pataka Tea. The train was so messy and confusing that even you cant read the train name and coach numbers. Whole coach was overtaken by Pataka stickers (check video attached) and this all is for just few bucks Indian railway wanted to earn from auctioning ads on trains. I would like to call people to oppose and ask Indian railway minister to withdraw these ads, as it seems Indian railways 100 years glory and shine is sold for few lacks of rupees. This looks very ugly and I also request companies not advertise this way, as this looks very bad and create hate only for your products.